Studio Carry On Harry , Singapore invited Canadian Hockey Superstar of yesteryear Bernie Nicholls on the show to discuss his tenure as worldclass player in between 1981 to 1999. He shared with host his expereinces with NHL ( National Hockey League ) , playing under different teams over the years , his on going law suit with NHL over being not well informed about head injuries inflicted by the game and his new passion of forming All Sports Market , an all sports stock exchange , one of its kind. 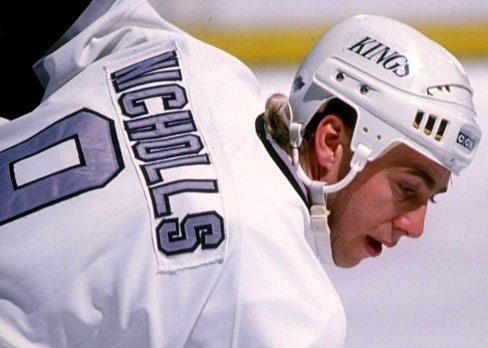 Over his 17-year playing career, Nicholls played over 1127 games for the Los Angeles Kings, New York Rangers, Edmonton Oilers, New Jersey Devils, Chicago Blackhawks and San Jose Sharks, scoring 1209 points. He is one of only 8 players in NHL history to score 70 goals in one season, and one of 5 to score 150 points. Nicholls was born in Haliburton, Ontario, but grew up in West Guilford, Ontario. AllSportsMarket is NOT gambling because what you purchase (stock) doesn't expire nor is there a one time payout. With sports gambling, people are in a 'win or lose' scenario. On AllSportsMarket we pay out dividends to shareholders after wins as well as 4 times a year, as quarterly payments. On a win, the shares DO NOT expire. The shareholders own the shares until they decide to sell them. Sports gambling creates an eternal conflict for fans. Fans cheer against their own team because they want the other team to cover the spread or they are cheering for the wide receiver on the other team because he is on your fantasy team. Basically, do you want to watch athletes giving everything they’ve got to the game? Or do you want to constantly question whether or not “the fix is in” during and after every single game. Bernie is one of only 5 people ever to score 70 goals in one season and one of only 8 people every to score 150 points in one season. Bernie played for 5 teams averaging over a point a game over his career. He won a Stanley Cup as a member of the LA Kings Coaching staff. Zack was born in 1970. He wanted to act, but his mom, an actress herself, wanted her son to be normal, and would not let him. Finally, his brother intervened, allowing Zack the chance to act. After a year of the small stuff, he got his first big audition for the '80s classic A Christmas Story (1983). About 300 kids showed up for the part (originally he was the sidekick, Grover), and he kept getting called back until it was him and one other redhead. He won the role. On the first set, in Cleveland, the director told him that he was to play the part of Scut Farcus instead of Grover. This was his breakthrough. Darrell is a superfan of the Los Angeles Clippers of the National Basketball Association. A season ticket holder since the 2000–01 season, he dances, leads cheers, and taunts the opposing team at home games in a half red, half blue suit—the Clippers' team colors. [ One of his usual chants is "Let's go Clippers!". A personal favorite of his is "U-G-L-Y, you ain’t got no alibi, you ugly! ", which he directs at opposing players when they shoot free throws. Azcentral.com in 2013 called him "one of the NBA’s last quality clean hecklers".